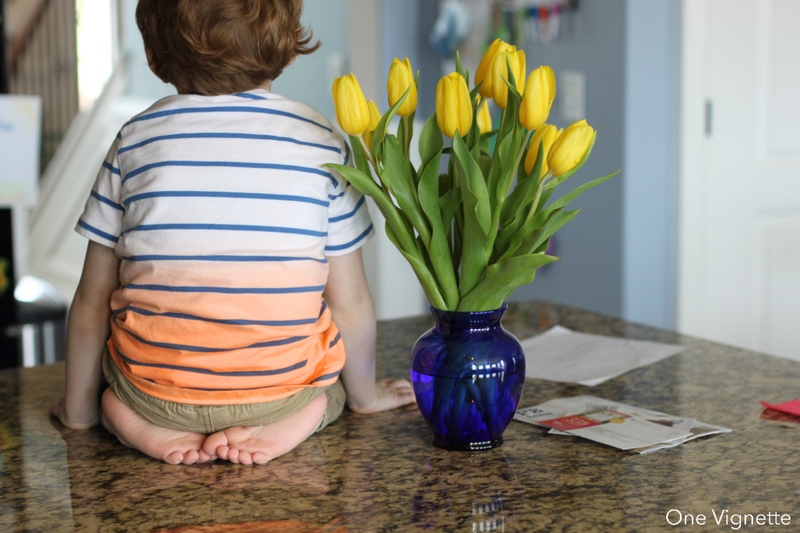 Cian noticed the tulips in their vase on the kitchen island and stopped his play. “When are dey gonna open?” he asked me. I looked at them, perfectly shaped, as they must have been all week. I couldn’t say for sure: I’d picked them up for six bucks at the grocery store on Saturday and really hadn’t noticed them since. 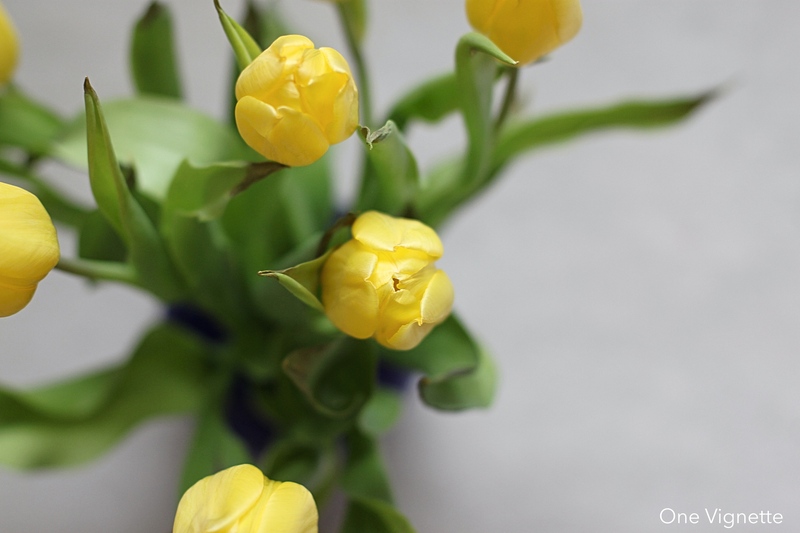 “Sure,” I replied, and picked him up to set him on the counter beside the flowers. Nervously, I circled, staying close, because even though I had a bunch of things to do and the chances of him falling off and cracking his head open were slim, you know. I’m not one to assume. But he sat there for the longest time–come on buddy, I have STUFF to DOOOOO–and other than when he kept calling out, “Don’t take a pictchah of me! Stop LOOKING AT ME!” he was really happy to just…watch the tulips. “When are dey gonna open?” he asked again. I grumbled. “Not YET, Cian. Probably not until tomorrow,” I repeated. Time was a-ticking, here. “Hmm,” was his quick reply. Then he settled onto his bottom and stuck his face close to the blooms. I let him sit there, because one has to indulge a child who wants to stop and smell the grocery store tulips. Not for hours or anything, of course, but a little while. And what’s funny is that since I got him down from the counter, Cian hasn’t said one more word about those flowers. They’re opening now, beautiful and vibrant and welcoming. I notice them each time I walk by. grocery store flowers for the win am I right?